Thierry Henry pictured during tonight's match. A WEEK THAT started brightly for Thierry Henry and Monaco ended in disappointment as they let in two late goals to lose 2-1 at home to rising Montpellier in Ligue 1 on Saturday. Youri Tielemans gave Monaco the lead in the 42nd minute, but Andy Delort levelled after 81 minutes and Petar Skuletic hit the winner with four minutes left. Monaco remain mired in 19th place in the 20-team division. Last weekend Henry eked out his first victory as Monaco manager at Caen, but on Wednesday his side lost away to Atletico Madrid, a defeat that ensured they will finish last in their Champions League group. “You’ve got to shoot into the empty net,” said Henry after the match. The victory lifts Montpellier to second. They are 13 points behind Paris Saint-Germain, who round off the weekend’s matches in Bordeaux on Sunday evening, but are just one point ahead of Lyon and two clear of Lille. Those two met on Saturday and drew 2-2. In Lille, the home team raced into a two goal lead with goals by Loic Remy, after 17 minutes, and Nicolas Pepe, after 28 minutes. Lyon, who drew by the same score against Manchester City on Tuesday to remain on course for the last 16 of the Champions League, by Bertrand Traore after 63 minutes and Moussa Dembele with four minutes to play. The Lyon president, Jean-Michel Aulas, also said he was happy with a point in the battle to finish second. 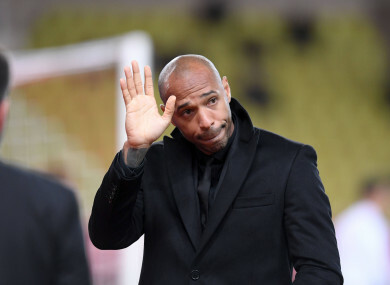 Email “Thierry Henry's Monaco 19th in 20-team Ligue 1 after latest loss”. Feedback on “Thierry Henry's Monaco 19th in 20-team Ligue 1 after latest loss”.